NEW YORK — For astrophysicist Neil deGrasse Tyson, the scientific exploration of our universe is one amazing voyage, and so too has been his run on the new "Cosmos." As host of Fox's science-themed "Cosmos: A Spacetime Odyssey," Tyson has carried readers back and forth through time, revisited scientists during pivotal discoveries and introduced a new generation to the wonder of space and science. The show debuted in March and airs its 13th and final episode tonight (June 8). Astrophysicist Neil deGrasse Tyson stands at the sea in a scene from "Unafraid of the Dark," the final episode of "Cosmos: A Spacetime Odyssey." "Cosmos: A Spacetime Odyssey" is a 21st-century reboot of the iconic 1980 PBS series "Cosmos: A Personal Journey" hosted by the famed astronomer popularizer of science Carl Sagan, who died in 1996. Like that original series, the new show is led by Ann Druyan, Sagan's widow and longtime partner, who serves as co-writer and executive producer. But there has been one major difference. This new "Cosmos" has been big. Unlike the 1980 series, which aired on public television, the new "Cosmos" aired Sunday nights on Fox, then again on Monday nights on the National Geographic Channel. The series was beamed out to 181 countries and launched with a tie-in app for mobile devices and well as a vigorous social media campaign. "I have a feeling that the reaction to the series has exceeded my wildest fantasies," Druyan told Space.com Friday during a conference call. She added that she was stunned last Sunday (June 1), when "Cosmos" came in neck and neck with "The Bachelorette," nearly win the night in ratings with an episode about global warming on Earth. "I have a feeling of just tremendous satisfaction that Fox and Nat Geo were brave enough to put this show on primetime, which hasn't happened on a commercial broadcast network such as Fox in recent memory," Druyan said. During a premiere of the final "Cosmos" episode, called "Unafraid of the Dark," here in New York Wednesday (June 4), Druyan said that Fox executive never once asked her to chance anything in the writing or filming of the show. The final episode of "Cosmos: A Spacetime Odyssey" retells the story of Viktor Hess, who discovered cosmic rays from a hot-air balloon, in an animated short. Veteran "Star Trek" series producer Brannon Braga served as an executive producer, as did Mitchell Cannold. 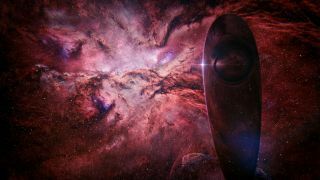 Composer Alan Silvestri ("The Avengers," "Contact") created the music for "Cosmos" while astrophysics Steven Soter, who also co-wrote the 1980 series, rejoined Druyan for the new show. For Druyan, the response to the new "Cosmos" has been overwhelming and touching. "It has come in the form of myriad tweets from people and emails from the public saying that 'Cosmos' has brought families together, that Sunday nights have become a family time again and how many parents and children and couples are watching this series together and most of all how profoundly moved they are by what is a rigorously scientific show," Druyan said. "That was my dream from the beginning." "Cosmos: A Spacetime Odyssey" will be released on DVD and blu-ray on Tuesday (June 10). Tyson and Druyan said they hoped viewers will enjoy the deeper look behind the scenes of the show included in the collection. The legacy of Carl Sagan can be felt profoundly in tonight's final episode of "Cosmos," which centers on the mystery of dark energy, NASA's Voyager missions, and takes a look back at the show's Heroes of Knowledge. In an especially poignant sequence, we hear Sagan's voice recounting his famous "Pale Blue Dot" quote as the camera zooms out from Earth, traverses across space until it recreates the iconic Voyager 1 photo of Earth from 4 billion miles away. "Look again at that dot," Sagan says. "That's here. That's home. That's us. On it everyone you love, everyone you know, everyone you ever heard of, every human being who ever was, lived out their lives." "Every saint and sinner in the history of our species lived there, on a mote of dust suspended in a sunbeam," Sagan continues. The moment instills a sense of perspective in the viewer and is followed by an inspiring scene by Tyson on the wonder of the universe. That wonder, and the potential of humanity, is what Tyson sees as a core value behind both the current "Cosmos" and its 1980 predecessor. "I think if enough people take the discoveries of science to heart, recognize its value of what it is to be informed citizens of democracy, what it is to be shepherds of our culture and our civilization, then maybe you'll never need another Cosmos," Tyson told Space.com. "And the schools and methods and power to accomplish that comes through the methods and tools of science."